Be introduced to Saturn’s largest moon, Titan, and the history of and science questions for the Huygens Probe from the Cassini-Huygens Mission. Listen to a fictional narrative told by the Huygens Probe entitled Memoirs of a Spacecraft, which includes real science and engineering facts. Hear about the findings of the Huygens Probe about Titan, and express those findings through their own drawing. Use their imaginations to personalize themselves as robotic spacecraft and write a story, poem, or song about their own journey to Titan. Activity Goals: Increase participants' knowledge about Saturn’s largest moon, Titan; learn some of the science and engineering considerations that go into robotic spacecraft design and flight in space; become familiar with the use of science instruments in space. Gather the Saturn Discovery Logs to pass back to students. Students have many different kinds of learning styles. Some students learn best when they hear information — others when they see it. In this activity, information is read aloud. To support a greater number of students, consider charting the most important information and posting the story for student reference. The more ways a student experiences the information the more likely they are to retain it. Practice reading "Memoirs of A Spacecraft: The Huygens Probe Encounters Titan"
Some students may have trouble visualizing themselves as an object, especially one with parts similar to their senses. Walk around as they write their story and help them add what their “spacecraft senses” are learning to their story. Remember that instruments are doing the sensing, not our bodies. 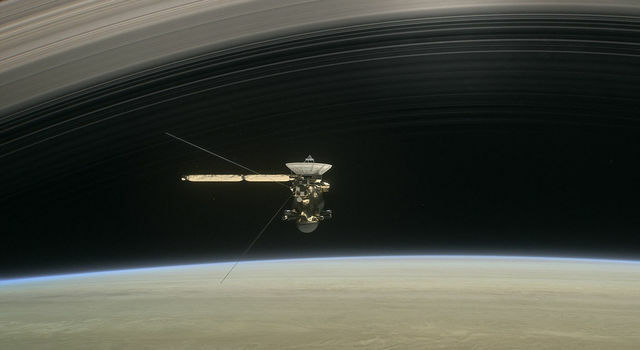 Engineers took the science questions for the Cassini-Huygens mission and interacted with scientists in different ways to express their concepts — from drawing and building models to developing sophisticated computer plans. Once they had these plans, the engineers knew how to build the proper spacecraft and instruments for the mission. Instruments on the spacecraft function like the senses of our body, sometimes greatly enhanced. Each of the Cassini and Huygens instruments has a specific task to gather a certain kind of information (data). Hydrocarbon: A compound of hydrogen and carbon. Memoirs: An autobiography or a written account of one’s memory of certain events or people. Probe: Something that is used to search or discover. It can be a tool, a machine, or a spacecraft. As we’ve discovered already, the Cassini spacecraft dropped a special robotic spacecraft called the Huygens Probe onto the surface of Saturn’s moon Titan. This probe has collected information that will help answer many questions about Titan, such as what is the surface like? Ask the students what questions they have about Titan or the Huygens Probe. Chart their responses. Tell the students that you will read "Memoirs of a Spacecraft: The Huygens Probe Encounters Titan" to them. Encourage them to take notes in their Saturn Discovery Logs as you read. Explain to them that they will draw what they think the surface of Titan looks like based on clues they hear in the story. Remind the students that it is a story written from the point of view of the Huygens Probe. The probe is not alive, so this part of the story is fiction. However, they will also be hearing actual scientific information about the Cassini-Huygens mission and about Titan. Read the "Memoirs of a Spacecraft: The Huygens Probe Encounters Titan" to students. Remind students to take notes as you read to them. Once the story is finished, have the students begin their drawing/sketch of Titan’s surface based on the notes in their Saturn Discovery Logs. Tell them to label the parts of their drawing. Tell the students that they will keep their drawings in their Saturn Discovery Logs. As they learn new information from the Cassini-Huygens mission, they can make changes to their drawings. Optional leader reading: Read aloud all but the last paragraph of page 4 from the mini-book “Saturn’s Moons,” showing the illustrations. When the Cassini-Huygens scientists told the engineers what information they wanted to learn about Saturn and its moons, the engineers set to work deciding what kind of spacecraft should be built. In thinking about the data the scientists needed, the engineers had to decide what kind of instruments to build and how those instruments would be used to collect the right information. Most instruments on the spacecraft function like the senses of our body, greatly enhanced. Each of the Cassini-Huygens instruments has a specific task to gather a certain kind of information (data). The cameras are the eyes of the spacecraft because the team needed pictures of Saturn, its rings, and its moons. The computer on the spacecraft is like your brain running all the programs needed to keep the spacecraft safe and functioning. The spacecraft antenna is like your ears and mouth and it can both “hear” instructions from Earth and “speak” reports and data back to the team on earth. What does your spacecraft look like? In what ways does your body receive information and data like a spacecraft? How will your spacecraft get to Titan? 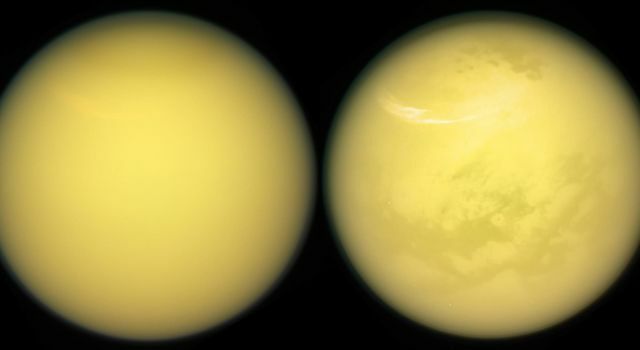 What science question do you want to answer when you get to Titan? Why do you think your science question is important? What are some reasons that knowing about Saturn and Titan is important? Give students time to share their drawings with partners and/or the whole group. Post their drawings, or direct the students to put them in their Saturn Discovery Logs. Ask the students to read their stories out loud. When they are finished, their stories should also go into their Saturn Discovery Logs. Did the students include information from the Memoirs of a Spacecraft in their drawings? Can they clearly explain the different parts of their drawings? Did others in the class comment with interest on each other’s spacecraft designs? Encourage the children to envision the food on their plate as the surface of a planet and discuss with their family the different ways their body’s “instruments” (senses) can detect what the food is like. Encourage them to describe to their families any kinds of food they think the surface of Titan might look like. Encourage families to visit the interactives section of the JPL Exoplanets website. Take an alien safari and find out about extreme life forms. The site has fun facts, animations, and “wild” information for families to share. Give students an opportunity to learn what the folks at NASA’s Jet Propulsion Laboratory experience. Read blogs from scientists and engineers. And meet members of the Cassini team and learn what they do. Jeff Cuzzi, Ph.D., is a research scientist at NASA Ames Research Center in Mountain View, California. One of his first jobs was lead scientist on the first Titan Probe study — an early concept in designing a probe mission to explore Titan — that helped lay the foundation for the Cassini-Huygens probe mission. Today, Jeff is the head scientist of Cassini’s Rings Discipline Working Group, charged with leading Cassini’s scientific study of Saturn’s rings and its interactions with Saturn’s environment. Jeff’s favorite career moment was arriving at JPL for the Voyager 1 Saturn encounter and seeing the dozens of big media RVs lined up. Saturn was big news! “I was blown away by how well the images we had planned using my brightness models had turned out — beautiful, glowing images of the rings. 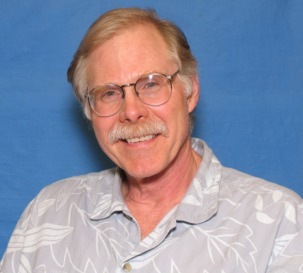 Everyone was ecstatic, including me.” In 2010, Jeff was awarded the Gerard P. Kuiper Prize, the most prestigious individual award in planetary sciences. Read Jeff’s profile. And read about the contributions of Jeff and his colleagues at NASA Ames Research Center to the Cassini-Huygens mission. Watch an animation of the Huygens Probe’s descent to the surface of Titan. 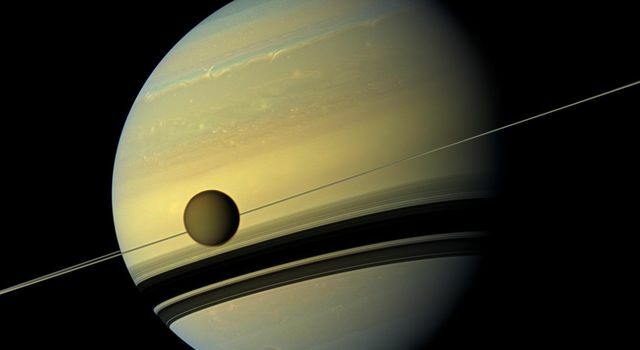 Ask the students to make a model of Saturn or Titan. Tell them to label any features they think are important. Have students bring recycled materials from home over the week before this project. Here’s an idea for making a model of Saturn from an old CD and a polystyrene ball. Print and laminate copies of the moon cards for pairs of students. Have the students group the moon cards in at least three different ways. Then ask them to describe the criteria they selected for each of their groupings. Have the students observe the cards closely, and write a “show not tell” descriptive paragraph about a moon of their choice. Have students read their paragraphs aloud, and let the whole group/peers guess which moon they have described. Create a room poster or bulletin board using images of Saturn or its moons. Have students write, “I notice” (observations) and “I wonder?” (questions) on notes and post on the board. Students can select a moon that they would like to learn more about and write a creative piece. A writing piece might be a short report of information. It could also be a poem. Students could even write fictional autobiographies, and pretend that they are one of the moons.